It is time to update your blog and YouTube channel with the latest 10% off discount code! 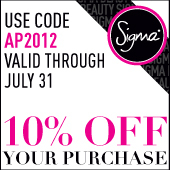 The code AP2012 will be valid from July 1 - July 31 for 10% off your entire purchase. To easily share the discount code with your followers, simply save the banner image to your computer, upload it to your blog as a picture and insert your affiliate link as the URL. Sharing the discount code along with your affiliate link is an extremely effective strategy. Don’t miss out! Do you have to live in America to become an affiliate? Anyone is welcome to join the Sigma Affiliate Program! We have affiliates from all over the world! If you are not a US citizen, you can put any number in the Tax ID section on the sign up form (it is only needed for US citizens). You can contact affiliate@sigmabeauty.com for more information! Thank you! Hi! Can you please make a version of these banners in Spanish? Hi Dimitri, thank you for your suggestion! At this time we do not have this banner available in Spanish, but it is a great idea for the future. Thanks again! Please contact affiliate@sigmabeauty.com for help uploading a banner, thank you! What is the free gift with $30 over purchase for July? Make sure to type in the code, do not copy and paste it! Please contact affiliate@sigmabeauty.com if you have additional questions!